Shedding is at best a mild annoyance and at its worst, can be the sign of a bigger health issue. Most often, shedding is routed in a nutritional deficiency or skin irritation. Both of which are corrected through diet change. Do not feel overwhelmed by the number of options available. We are here to help you navigate the ins and outs of finding the best dog food for shedding. Are you ready to get started? Who is the Top pick? We’ve done all the research for what is tried-and-tested and what just does not work. Here are five recommendations which target building nutritional intake from what your furry (or not so) friend is currently getting. There is not one particular must have for long or short hair. All of these aim to target the nutritional deficiencies that are unfortunately a big role in our dog’s lives because of the dog food they’ve been getting. Keep in mind what you want from the food you’re giving your dog. These are really the key contenders in not only battling shedding but allergies as well. Often shedding can occur due to allergies that your dog is experiencing through their skin being affected. Another sign of allergies that often seems to cause shedding is itchy skin. You will know if your dog has itchy skin when they are constantly rolling in the grass or on the carpet, and rubbing on really anything they can get close to. They will also bite themselves or paw chew. These are all major signs that an allergy could be at play and the root cause of over shedding. Now, if your friend has not shown any of these signs odds are they are missing out on a necessary vitamin or mineral. This is not surprising because unlike the options listed here most dog food is crafted from meat by-products and vegetable remnants. Basically, your dog gets leftovers and those same companies’ shame people who feed their dog’s table scraps. We know you care about your furry friend, and we do too. So, what does each of these options offer? Orijen is a brand that is made overseas but packs a punch that many domestic dog foods cannot rival. Although the brand provides that they manufacture these products in the USA. Unfortunately, this nutritional excellence comes at a pretty steep price and you usually cannot find it on store shelves. But, the benefits are worth a good look! Orijen’s one downfall is its price. But dogs love it. 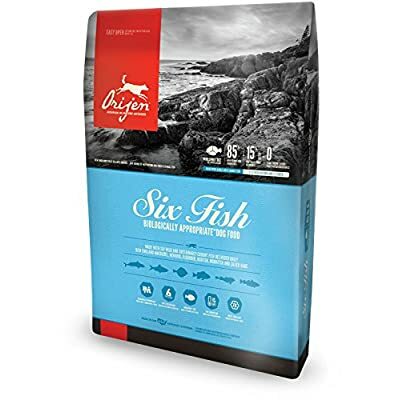 We have not seen any feedback of a picky eater refusing to take down a bowl of Orijen’s 6 Fish formula. The Fish formula is a clever approach to the shedding problem at hand also. Fish are rich in oils that are naturally beneficial for nearly any hair type. Making this option a universal pick for a pup with a shedding problem. Acana is a brand you do not often see because they strive on finding ingredients that well, do not always make sense. Like we see here, a duck and pear combination is not something you would expect even in high-end dog food. However, Acana uses odd combinations like these to address particular issues at hand. Although this formula is meant for diets with hypoallergenic needs, it is a prime choice to address shedding. What does Acana offer with its odd combinations? Primary ingredients throughout formula: duck and pear. Acana works with this formula to deliver simple ingredients that deliver a lot of nutrients, vitamins, minerals and amino acids. Nature’s Variety offers a formula that heavily restricts the ingredients that are normally used in dog food to help skin conditions, shedding, allergies and as a natural side-effect. What does Nature’s Variety offer? Nature’s Variety has taken a different approach to nutrition and instead removed everything that is not overly dense in nutrients. Their limited ingredient line is all designed around diet control. They use one animal protein and one vegetable to build a strong defense with a focus on meeting mineral and vitamin needs. The animal protein options they have are a duck, lamb, salmon, and turkey. We saw with Acana and Orijen the benefits of both fish and duck. This is happening again here. Oil-rich proteins are believed to deliver what dog’s skin and coats are currently lacking. There really is not a downside other than there is tapioca on the ingredients list which can be a turn off for some pet owners. Wellness is a well-trusted brand that delivers quality ingredients and takes a similar approach to other brands here. Overall Wellness is a great option for any dog and pet owner. They have honed in on natural ingredients and hone in on helping your dog having a long, happy, and healthy life. This includes not losing their hair! Pinnacle offers a great range of options for pet owners who are seeing too much shedding on the couch or on their clothes. This is the one wet food on our list. It is a bit expensive but moderately priced so far as high-quality wet dog food goes. 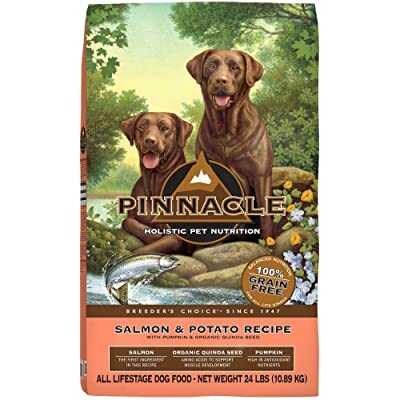 While Pinnacle has added a lot of great vitamins and minerals through supplements they are missing key aspects that shedding dogs need. The dry food option which is not always available takes the same route. They work by adding supplements to make a complete and balanced meal. Unfortunately, this means they are missing key elements we are looking for to help in shedding. They don’t deliver in high-quality Omega-3 or Omega-6 fatty acids and are missing key oils as well. Acana attacks these by using all the meat, bone, organ and cartilage of the duck. While we normally stray from using much more than the meat in our own dishes, your dog has different needs. Imagine a few hundred years ago, this is exactly what your dog would have been eating. By using the bone, organs, and cartilage as well as the meat they capture the vitamins, necessary metal and fatty acids that are stored there. 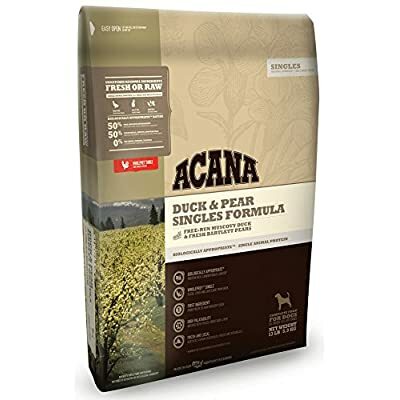 Acana is a top pick for filling in any nutritional gaps your pet is experiencing. However, the downfall that Acana has is its price. Followed closely by its availability, which is typically online only. This is a pretty pricey upgrade for your dog’s food. We’re by no means saying that it is not worth it. In fact, if you have a small dog that will take its time working through this twenty-five-pound bag then you might not feel the change in your pet’s budget so much. However, if you have a large dog that eats a lot you may be looking for a slightly more moderate price to help in your dog’s shedding issue. If you try a few cheaper things and they do not work we still definitely recommend changing up to Acana. You get everything you pay for and ultimately the price is worth what your furry friend is getting out of it. 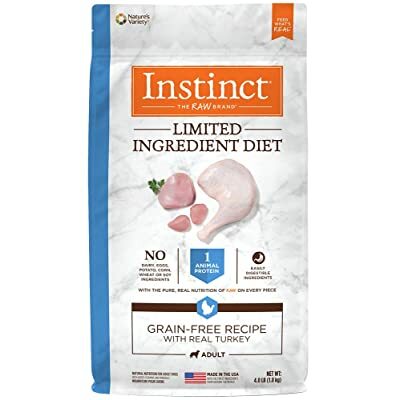 So what makes Nature’s Variety Instinct Limited Ingredient formulas different from other options here is that theirs is the most concentrated ingredient list. Not only does this mean that you know exactly what you’d dog is getting. You know what they are not getting! Unnecessary preservatives, chemicals, and chemical treatments have been completely eliminated. Chemicals, preservatives, and fillers aren’t the only thing that Nature’s Variety has removed from their ingredients list. Anything that was not determined to be “easily digestible” did not make the cut. This does not just mean good news for your dog’s digestive system. What this means for shedding is that they are getting more nutrients from their food. Easy to digest food means that your dog’s system begins extracting the necessary amino acids and oils quickly and earlier into digestion. This makes Nature’s Instinct a good go-to for any shedding dog regardless of age, or breed. There are two downfalls that pet owners experience when searching for the good dog food for shedding and find Nature’s Variety. First, it is kind of on the experience side. Second, and more importantly, it’s medium sized kibble. The kibble size can make it difficult for breeds with less jaw strength and smaller mouths to eat. Although many puppies don’t have a problem with it, I would keep an eye out for aged small breeds. They may need a different solution to their shedding problem. This option is probably the best-priced option on our list today and it has a lot more availability than some of the others. You can find it in pet stores like Petsmart. So when it’s the day you ran out of dog food and you remember on your way home from work you can find this in a store near you. How Do Ingredients Affect Hair Loss and Shedding? Wellness breaks down the science behind hair loss and shedding on their packaging! This is great for anyone who is browsing for dog food that can help with shedding. Wellness Simple formulas build on your dog’s immune response to specific foods and how to construct a healthy response in a variety of options using the same formula. They point out that often itching, hair loss, and paw licking can be indicators of a food allergy or intolerance. Resolving that the possible solution to hair loss and shedding is a diet based issue, they work to provide multiple options for picky eaters and picky pet owners. 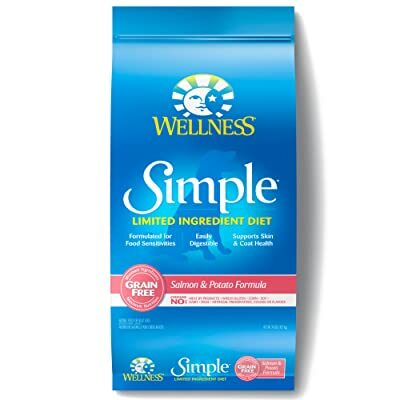 Wellness Simple Natural Limited Ingredient Dry Dog Food! This moderately priced, and easy to find dog food pulled out all of the stops when it comes to shedding. Their recipes are made with high-quality ingredients that can help condition your dog’s skin and coat. The overall goal is not only to reduce shedding but to ensure their fur is healthy and your dog is happy. Wellness Simple formulas deliver on this mark and it is our highest recommendation. If you are looking for the best dog food for shedding we think we’ve found it. WOW! This article really useful for me. I have a little dog but I confused for choosing the dog foods information what would be the best for everything. But review this article my confusion has cleared. Thanks a lot for sharing such an informative article about “Best Dog Food for Shedding and Dry skin” and I’m sure most people can take notes from this article. One thing most people lack experience while aware of healthy dog food. Well, this post will give me much good ideas for healthy food. Thanks Johnson and keep it up…….